DELGODA: Two suspects arrested on suspicion of killing five members from the same family over a land dispute in Delgoda on Saturday were shot dead by police in self-defence when the suspects attempted to attack the police in Delgoda yesterday. The main suspects of the multiple murder E. Amaradasa and his brother E. Upasena were shot dead by police in Mahawatte, Delgoda yesterday at around 1.00 a.m, Kelaniya Division SSP Nihal Samarakoon said. Amaradasa and Upasena under Gampaha police custody led a police team to show the weapons used to murder the family. “When the police team approached the backyard of Amaradasa’s house, he suddenly emerged with two hand grenades and attempted to attack the police team. “The police shot the suspects in self defence,” SSP Samarakoon told the Daily News. Two suspects Amaradasa and his brother Upasena who were trying to flee Colombo were arrested by Gampaha police in Delgoda around 4.30 p.m. on Tuesday, Gampaha ASP Lakshman Cooray said. “During the inquiry the two confessed they murdered five members of the same family last Saturday over a land dispute. They also told the police where they kept the clubs used to kill the victims,” ASP Cooray told the Daily News. The victims were M.Tilakaratne (36), his wife D.Ramyalatha (34), his mother-in-law A.Pabawathi (80) and his sons Dilshan Mauwanthi (08) and Sachintha Lakshan (04). A police team from Gampaha accompanied the two suspects to recover the murder weapon. The suspects tried to throw hand grenades at the police officers and the police shot them in self defence. 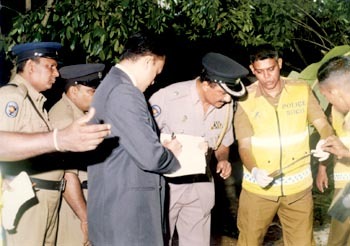 The two suspects succumbed to injuries at the Gampaha hospital, he added. The police recovered two hand grenades and the murder weapon from the house of main suspect Amaradasa. ASP Cooray said Amaradasa had a land dispute with Ramyalatha. The verdict of the court case in this regard was to be delivered this week. It was revealed that Amaradasa has given a contract to kill the family five months ago, but the contract killers failed to complete the task. Amaradasa and his brother then killed the victims before the court verdict, the ASP remarked. Ramyalatha and her 12 year old daughter Dinusha Madurangi, the sole survivor, have been raped before they were clubbed. Madurangi who suffered head injuries is critical, the ASP said. Meegahawatte and Gampaha police are investigating.